Territorial diagnosis is an essential starting point for the development of a territorial project. It often builds on a collaborative work with different stakeholders of the territory. The first step consists in a field work to collect available data and to interview a diversity of local stakeholders. Subsequently, an in-depth work on both quantitative and qualitative collected data helps to provide a snapshot of the territory, shared with stakeholders. ACTeon mobilizes its team’s skills and experience on territorial diagnosis for different sets of projects, like the development of water management master plans, or studies for agricultural supply chains implementation. The diversity of concerned sectors thereby involves all of ACTeon’s skills. The definition of a backcasting strategy to reach the desirable scenario. 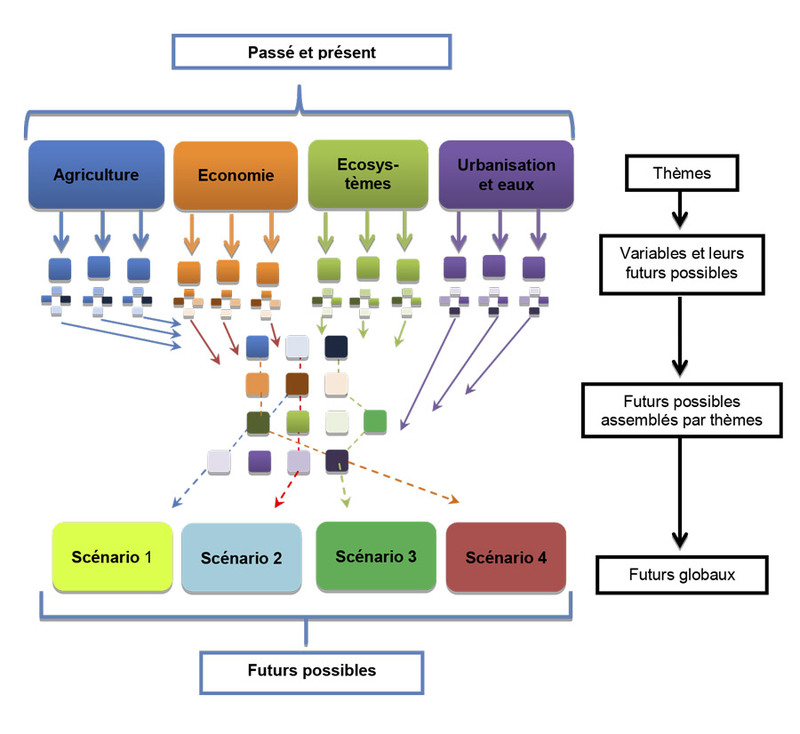 The future of marine spatial management (Dessine-moi un système Mer terre). These exercises can potentially be coupled with participatory methods or modeling. For all field projects (Diagnosis-Study-Evaluation), ACTeon implements approaches and methodological tools based on Social Sciences and which aim at better understanding wide audience and stakeholders perceptions of a particular phenomenon. Social representations of water reuse (research project DEMOWARE), of water management issues (Study for the optimization of water governance in the Mont-Saint-Michel Bay), or of the interface between terrestrial, coastal and marine areas (research project “Draw me … a sea-land system) can for example be explored and analyzed. The exploration and analysis of social representations are considered as social and collective constructions of symbolic images, attitudes, values and beliefs linked to an object, and always intend to strengthen capacity of stakeholders to act.This approach through social representations is therefore essential to understand the specificities of studied contexts or objects but also to strengthen skills and autonomy of stakeholders: decision-makers, technicians or users. Tools mobilized, such as semi-structured interviews or focus groups, allow to gather qualitative information (stakeholders speeches, visual representations, etc.). Depending on the needs, quantitative tools (questionnaires) can be used on a complementary base to target a wider audience. More globally, it can be highlighted that this comprehensive approach enhances stakeholders acknowledgement and, hence, motivations and involvement in projects. ACTeon mobilizes its Social Sciences skills and experience gained on the field to implement these approaches. Social acceptability should be understood as a “process of social negotiation linked to collective and communal deliberation ability 1 ». Thus, social acceptability differs from the level of acceptance of a project by communities, which will be analyzed at individual level in terms of positive and negative behavior and at collective level in terms of agreements and disagreements. As an iterative and dynamic process, a project’s social acceptability relies on diverse criteria which can be “worked on” over the time of a study and through diverse intervention strategies (information-persuasion-education) towards concerned groups on a specific territory. Being far from a utilitarian vision where social acceptability would be no more than a tool for making projects accepted, social acceptability enables to reinforce the “action power” of stakeholders and users, through social sciences-based approaches (particularly interviews and focus-groups)and interactive pedagogy (groups and collective learning dynamics). On this intervention axis, ACTeon can mobilize its competences in social sciences, its thematic expertise and its skills and experiences in facilitation. CAP and Trade : the European research project CAP and TRADE (2010-2014) analyzed the impacts of quantitative water management approaches based on individual and transferable quotas trading. ACTeon has been in charge of analyzing the social acceptability of this management methods by building exploratory scenarios (methodological coordination and exploration within the context of Marais Poitevin). DEMOWARE : the European research project intends to build up arguments towards policymakers in order to encourage waste/treated water reuse. Within this project, ACTeon is strongly involved in the working phase on social acceptability of waste/treated water reuse in the Vendée Greenfield. Evaluation process therefore mobilizes criteria of efficiency (balance between means and results), effectiveness (achievement of objectives), internal and external coherence, relevance (answer to issues). Policy evaluation can be ax-ante (before implementation, “foresight”), in parallel (during the implementation, for example at mid-term) or ex-post (lessons learned-evaluation, “hindsight”). ACTeon overtakes the aspects of performance and evaluation engineering based on the pair efficiency/effectiveness to develop policy evaluation with proven social utility, largely taking into account the implementation context as a fundamental success factor or constraint of public policy. ACTeon also favours participatory approaches at various steps of the evaluation, seen as a collective process preparing subsequent phases (such as the second implementation phase or the construction of a new action plan). ACTeon can combine expertise in sociology, economics, political sciences and geography. Others :“grenellisation” of the State-Region project contract on behalf of the Alsacian regional authority. Economic tools for policy making. Our expertise is particularly rich and specific: it combines theory (participation in European research projects, development of tools and economic evaluation methods) and practice (applied analyses and evaluations at local, national and regional scales; conducting surveys and recommendations for decision making) thus enabling an innovative and pragmatic approach to the main issues faced by policymakers. ACTeon has developed expertise in the evaluation and development of economic instruments to encourage better management of environmental resources, notably in the field of water. In this way, ACTeon has particular expertise with respect to cost recovery of water services, assessing the relevance of taxes and fees for the preservation of water resources and developing exploratory instruments such as nitrate taxes and payments for environmental and ecosystem services. Even if the environment is has no actual price, it is nonetheless of great value to mankind as recalled by the Millenium Ecosystem Assesment (2005), which highlights the variety of services provided by diverse ecosystems worldwide and the importance of their evaluation. In these lines, ACTeon mobilizes quantitative and qualitative valuation methods such as revealed preference methods (travel cost method, hedonic pricing) stated preference methods (contingent valuation, choice modeling), cost approaches (replacement costs and variants, averting behavior) and other methods (benefits transfers) to cover the entire range of environmental valuation methods. ACTeon has particularly assessed the value of ecosystem services provided by European wetlands and the value of the Alsatian “Common Hamster”, an endangered species in France. ACTeon makes use of the previous economic methods and valuation techniques to develop tools that facilitate decision making such as social, governance, cost-benefit, cost-efficiency and multi-criteria analyses. Through these tools applied to different environmental fields, ACTeon advises on necessary policies and measures that need to be implemented in order to preserve the environment in the most efficient way and account for impacts at all levels of society. For instance, ACTeon has carried out a cost-efficiency analysis for the implementation of the Marine Strategy Framework Directive in France. Supporting public policy-making often implies to provide assistance for the building of a strategy, a plan or an action program for a coming period. For example, in water management, River Basin Management Plans result in the development of strategies including objectives, operational guidelines and targeted actions. ACTeon makes recommendations on project leaders, deadlines and means of implementation where costs and financing sources are defined. A further example concerns territorial climate-energy plans or master plans that aim to define a territorial strategy through participative processes.